WITCH TIP: For tips on how to use this site, including secret navigation links, please click here. is one that is woven into daily life. That's what Wicca Spirituality is all about. It's a way that I inspire people to connect with themselves, with their bodies, with the Earth, and with the Divine... especially the Feminine Face of Divinity, the Goddess. And this is more than mere philosophy: it's an entirely practical, down-to-Earth set of practices and perspectives that can help you clear away the old patterns and traumas of the past, and move forward into being more of the person you know, deep inside, that you can be! Part of my method is incorporating the cutting edge of the New Sciences, demonstrating and proving why energy and magick/manifestation are real, and how they work. It's a very exciting time to be alive! Everything our ancient masters knew is now being proven by science! This is one of the things I'm most known for: bringing the science and the spirituality, the transcendent and the grounded, the esoteric and the practical into a harmony that makes sense of all of it together. My passion for exploring, experimenting, and teaching spirituality was fueled by several visions I've had... in particular one that came to me in a 10-day intensive meditation retreat. I had this moment of unshakeable awareness where I perceived that Goddess/Jesus/Buddha/Semi-Divine Being of Your Choice is being reborn on the Earth... not as one individual, but within all of us! (My immediate response to this knowledge was relief: if everyone is the "saviour," that wisdom can't be killed off as it has been in the past. That momentary flash of insight took years to fully understand... and even longer to figure out what it meant for me, in terms of my Life Mission. My fascination with spirituality started early in life, despite my early spiritual education in Catholicism (which I left behind as soon as I left home). When I was a child, I had experiences that I could barely describe, and that no one around me seemed to understand. I meditated when I was supposed to be taking a nap. I entered altered states of consciousness with ease. I stepped outside of time. And the family ghosts were very much present and making themselves known. To list just a few examples. In short, I grew up knowing, without any doubt, that what I was told about life wasn't the whole story — not by a long shot! Then a life event happened that catapulted me into the spiritual fast lane: I woke up one morning, and found my best friend/co-worker/housemate/sister-in-law dead, at age 22, cause unknown. It was the wake-up call that started me on a full-time exploration of life, death, myself, and spirit. After a lot of soul-searching, I realised I needed to find some kind of spiritual understanding that spoke of Truth to me, and that led to actual experience with the Divine. My background in religion was woefully lacking in both. I set out on an intensive spiritual exploration... within myself, within Nature, and within various spiritual traditions. So, for my entire adult life, I have delved deeply into spirituality in many different forms... including the new sciences. And I've had a lot of incredible mystical experiences, which served as guideposts on this journey to higher awareness. This has been my life's Calling. I dove seriously into Buddhist meditation, and other forms of meditation, including Vipassina. I even took yoga at the local YWCA — an unheard of activity at the time! (I loved it! Especially doing Sivasana at the end of each class: it was a guilty pleasure... I felt like I was getting away with something forbidden, just lying down and relaxing for 10 minutes!
) It wasn't really a spiritual practice, though; just a physical aspect of yoga, and I didn't know for years that there was more to yoga than that. Immediately, almost out of nowhere, my brother introduced me to Wicca. I have been a practicing Witch ever since . . . about 35 years now. Since then, Wicca has been my primary spiritual path. It wasn't a clear road from there, though! Because something happened that challenged my understanding of Wicca and spirituality entirely, and set me off on a new level of spiritual quest. During my Wiccan Initiation, I had an experience that was so intense, I literally thought I was dying. I won't describe it here, because I don't want to influence what people think an Initiation should be... most of them aren't so life-changing, yet still are potent and perfect for each person. However, I will say that it was nothing like I'd been led to believe. And nothing I found in Wicca could explain what happened to me! I'd even asked world-renowned Wiccan teachers, with no result. So I knew there was a lot more going on than even Wicca was teaching! And I couldn't rest until I found an understanding of my experience. That led me to a study and practice of intensive yoga (gathering teaching degrees in several forms of yoga), which was really powerful, spiritually. I knew there were answers there that Wicca was lacking. But it didn't really satisfy my heart. Thus began many years journey, seeking a way to harmonise these two, seemingly incompatible spiritual traditions... a journey which culminated in the birth of Wicca Spirituality. My family lineage is descended of Druids, and there's a long list of supernatural occurrences in my family... but I don't believe genetics necessarily qualifies anyone. After all, even if you're born with wings, you still need to learn how to fly by yourself! So that's what I've done. Besides being a practicing Initiated Witch for 35 years, and High Priestess for most of that time and being part of the same coven since 1993, I've deeply explored Wicca, magick, healing (including years of Geotran energetic healing), and various spiritual traditions around the world. I've studied at the ULC Seminary, and am an ordained minister. I'm also certified through extensive training at Yasodhara Ashram to teach Hatha Yoga, Hidden Language Hatha Yoga, Kundalini yoga, Dreams yoga. But credentials in the spiritual realm don't count for all that much. Some of the best, and the most widely acclaimed, spiritual teachers have credentials in entirely unrelated fields — psychology for Wayne Dyer, for instance; geology for Gregg Braden; medicine for Deepak Chopra... to name just a few. And a lot of people with credentials in Wicca — like Gardnerian "degrees" for example, or coming from a lineage of Witches (proven or not) — don't of themselves translate into real qualifications for teaching spirituality. As a writer, I've had numerous pieces published... among others, I've been a regular contributor to We'Moon for many years, and had poetry published in the collection Sea, Sky, and Dreams. 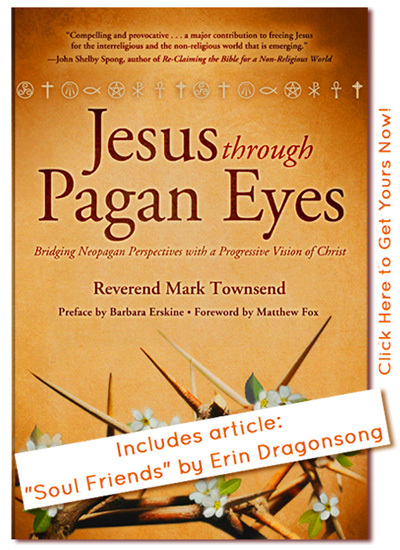 Most exciting so far, I was published in the anthology Jesus Through Pagan Eyes: Bridging Neopagan Perspectives with a Progressive Vision of Christ , edited by Rev. Mark Townsend, who has said, "Erin Dragonsong ranks among the biggest names in the Pagan world." I've been a featured interview on NCKabballah Radio, which was a lot of fun. 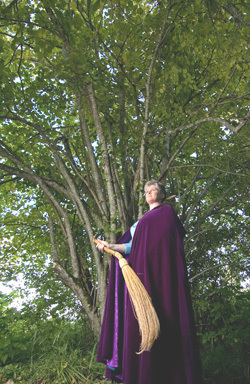 Jeff Daugherty, the host, has this to say: "For knowledge about Wicca, you really can't do any better than Erin's website. [She is], I believe, are one of the people on the forefront of helping that [Transformation of the Earth] happen… a woman that is a recognised expert internationally for offering insights and spiritual perspectives on Earth-based religion, and we're talking about a website that has over 3/4 of a million visitors per year from 159 countries around the globe. (And that was several years ago!) This is a lady that knows what she's talking about; you've heard her heart, she's not someone that's all head and no heart: this is a lady that lives and breathes to help you." I've studied with and been in a private healing circle with (for) Starhawk (she was kind enough to later favourably review Wicca-Spirituality.com for me), and studied innumerable Wiccan and spiritual resources through books, Witch camps, and workshops. One of the best experiences of my life (personally, as well as professionally) was the Science and Spirituality Conference in 2018 — a full week of 14-16 hour days with many of the greats on the cutting edge where science meets spirituality: Gregg Braden, Lynne McTaggart, Joe Dispenza, Bruce Lipton, Lee Carroll & Kryon, and more. It was an intensive course in the new sciences' support for spiritual wisdom, and I was thrilled to meet Gregg, Lynne, and Bruce — people I have enormous respect for (and they were just as kind and warm in person as one could hope). I'm one of the Voices on the Harmonic Concordance, and also a member of the United Communities of Spirit (Global Interfaith Initiative)... a network of people who participate in bridging across religious doctrine to the spirit of the Divine that is available through every religion. I've taught workshops in places like the Wild Women's Festival in Naramata, BC, and was facilitator for the Adult Daughters of Dysfunctional Families support group at the local Women's Centre for several years. And of course, we mustn't overlook the fact that Wicca-Spirituality.com has been a leader online for info about Wicca for many years! I've been quoted on innumerable sites (not that that means much these days, when pirating content is so common), but also by very reputable resources, like ReligiousTolerance.org. It has won the Pagan Web Award from Pagan-Magick.co.uk, and recognition from sources such as TheologyDegreesOnline.com, in their 100 Top Twitter Feeds, which said that I "do a great job of helping our readers diversify their knowledge and broaden their faith." My own publications include A Natural Connection: Discover Your Totem Animals And How They Can Help You, Nature Symbolisms: Communications From The Divine, The Personal Mandala Starter Kit, The Spiritual Mandala Templates Kit, and online 'Zine The Silver Chalice, (publishing since 2007!). I've also published 2 local magazines: Sparks! and Navel Gazing Bellydance & Spirituality Magazine. I still regularly practice several meditations and various Yoga practices, as well as developing my own highly effective, practical meditations and spiritual techniques. It may also be of interest to you that I'm a certified counsellor (briefly in private practice), and have a background in education, specialising in adult ed. I'm also a poet and singer, btw — which are key qualities of any mystic, I believe. There's more detail about my spiritual journey and particularly how Wicca Spirituality came to be, on my homepage. My life is dedicated to the Divine. I'm not perfect at remembering that, of course, but getting better at it all the time. 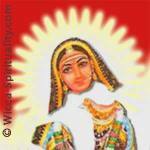 This involves developing a personal relationship with the Goddess in all Her aspects, and service to the Earth and all beings. This reawakening of the Goddess is, I feel certain, the only thing that can heal us and save the Earth. 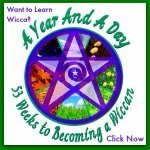 The aim of Wicca-Spirituality.com is to inspire and guide people to reach their full potential through Wicca as a spiritual practice. If you have any ideas on how I can better achieve this aim, I'd love to hear from you. 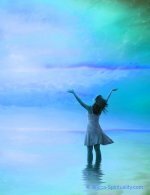 You can now search within Wicca-Spirituality.com for words and topics. Use Wicca Spirituality Sitesearch to locate information that you've forgotten the page it's on, and to search for all the pages on the website relating to a specific topic. There's also a Sitemap which shows exactly what pages are on this site, and links you directly to them. And of course the ever-popular tips on how to use this site. Please write to me if you have any ideas, thoughts, or concerns about the material on this site. I'd love to hear from you as we share this journey and Great Work together! If you have any comments, questions, or requests, please write to me. If you have any complaints or problems with the site, or find typos, PLEASE write to me! I endeavour to make Wicca-Spirituality.com a joy to use, and would like to fix any bugs. WITCH TIP: Click on the signature graphic - like the one below - on any page to send an email to erin Dragonsong.